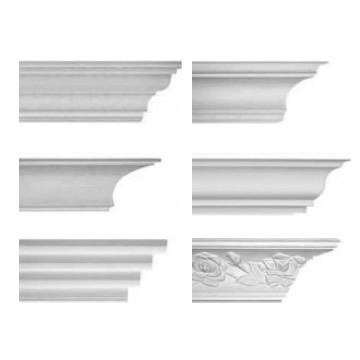 This is a selection of 6 samples of our small plaster coving products. Each of the samples about about 12 inches long and this sample pack is designed to give you a cross section of the varieties of small plaster coving products we stock. Small Plaster coving is most suitable in modern homes with relatively low ceilings. If your room is up to 10 feet high - a small plaster coving sample pack is an excellent choice in helping you make a decision as to which plaster coving product you should buy. 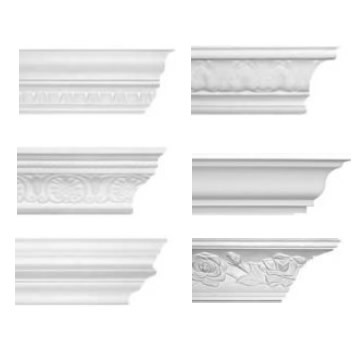 This sample pack includes 6 different randomly chosen plaster coving samples from our wide range of plaster coving designs - Not necessarily those pictured. If you would like to select a specific plaster coving sample - please either call us directly on 01723 321 111 to discuss your requirements or you can order plaster coving samples using this website at a cost of £2.50. We do not charge delivery on any sample product. Whilst our plaster coving comes in lengths of about 8 feet, we sell this coving by the foot or by the metre. These 6 small samples are each about 12 inches in length.